A glass of pomegranate juice a day could keep the wrinkles away, according to a new study that reveals it slows down the ageing process of DNA. Pomegranate has previously been linked to the prevention of heart disease and stress relief but now researchers from the Probelte Bio Labatory in Spain have found that the fruit juice also slows down the natural oxidation ('wear and tear') of DNA. During the study, scientists used a potent new type of pomegranate extract including the skin, pith and seeds of the fruit. The 60 participants were asked to take the extract for 30 days in the form of a pill. The results found a significant decrease in a marker associated with cell damage, that disrupts brain, muscle, liver and kidney functions, as well as causing ageing. The decrease in the ageing DNA was unknown to scientists until this study was conducted and researchers say they are, "excited about this study". Talking about the findings, Dr. Sergio Streitenberger, head of research, says, "We believe the study demonstrates that regular consumption of this new pomegranate extract can slow down the process of DNA oxidation." "We get old because we fall apart, cell by cell. One way to look at ageing is to think of it as rusting or oxidizing, a damaging process. The free radicals that oxidize our body's molecules include fats, heavy metals and numerous other chemical compounds we breathe, eat and drink. "If free radicals reach the DNA of our cells, the damage is cumulative and significant. Being able to guard against this process would be a significant breakthrough," Dr. Streitenberger added. 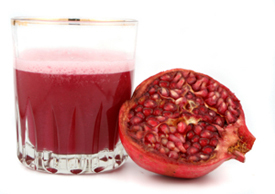 The health benefits of pomegranate juice have been widely known for some time as it helps lower cholesterol and blood pressure, as well as being a great source of antioxidant. 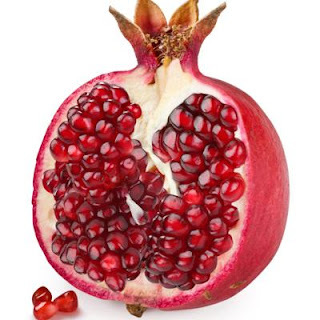 Pomegranates are chock full of ellagic acid — the latest phytonutrient to enter the scene (although it's been quietly hanging out in berries, nuts, and pomegranates for millennia). In laboratory and animal studies, ellagic acid has been shown to inhibit cancer cell growth and deactivate cancer-causing compounds. To take advantage of these health properties, incorporate pomegranate seeds into smoothies or use them to top off a bowl of yogurt or cereal. Other foods rich in ellagic acid include raspberries, blackberries, strawberries, walnuts, pecans, cranberries, and grapes (red, black, purple). Grapefruit, whose botanical name means "fruit of paradise," is a relative of the orange, with segmented, juicy flesh and a clean, tangy flavor. These fruits are categorized as red, pink or white by their interior color. The World's Healthiest Foods notes that while all colors of grapefruit carry a wealth of health benefits, red grapefruit may be most beneficial of all. Low in calories, high in fiber and phytonutrients, grapefruit is a healthy dietary choice. If you take prescription medications, especially statin drugs, avoid undesirable interactions by consulting your doctor before eating grapefruit. Grapefruit is bursting with vitamin C; a mere half of a grapefruit provides 46.86 mg, or 78.1 percent, of the recommended daily value. The World's Healthiest Foods lists grapefruit as an excellent source of this antioxidant, which supports cardiovascular health by preventing the oxidation of cholesterol. In addition, consuming vitamin C-rich foods supports the immune system, and leads to reduced risk of death from heart disease, cancer and stroke, says the site. Carotenoids are plant-based compounds that may have disease-preventing properties, and grapefruit--especially pink and red--contains more than its share of them. The World's Healthiest Foods states that one of grapefruit's carotenoid phytonutrients, an antioxidant called lycopene, may have chemoprotective effects. In a clinical study published in the March 2005 issue of "International Journal of Cancer," researchers found that prostate cancer risk declined with increased consumption of lycopene. According to Texas A & M University Extension, 3.5 ounces of pink grapefruit--about half of a small grapefruit--provides 3.36 mg of lycopene. Vitamin Herb University notes that estimating daily intake of lycopene is difficult due to variability in foods, but suggests most people consume from 3.7 to 6.5 mg per day. Another group of beneficial phytonutrients, limonoids, is found in grapefruit. According to The World's Healthiest Foods, limonoids help with detoxification by promoting the formation of an enzyme that helps cause toxins--including carcinogens-- to become more water-soluble, allowing them to be more easily flushed from the body. The soluble pectin fiber contained in grapefruit may slow down the development of atherosclerosis. The World's Healthiest Foods says that eating grapefruit can lower blood levels of LDL cholesterol--considered the "bad," or harmful, cholesterol-- as well as your levels of triglycerides, a form of fat linked to heart disease. Some scientific evidence supports grapefruit's cholesterol-reducing properties. In a clinical study published in the 2006 issue of "Journal of Agricultural and Food Chemistry," researchers found that, although red grapefruit had higher antioxidant potential than white, both white and red grapefruit decreased serum lipid levels in coronary atherosclerosis patients. Although grapefruit is a good source of fiber, the fruit is low in calories, with a half of a grapefruit containing a modest 36 calories. Grapefruit is a source of vitamin A, delivering 318.57 IU--or 6.4 percent of the DV--per half. Vitamin A is necessary for healthy vision and for the maintenance of teeth and skeletal and soft tissue. The National Library of the U.S. Department of Agriculture lists a half of a grapefruit as providing 348 mg--or 3.5 of the DV--of vitamin B5, or pantothenic acid, needed by the body to metabolize proteins, fats and carbohydrates. The World's Healthiest Foods states that grapefruit is also a good source of folate, or vitamin B9--crucial for brain function and for production of genetic material such as DNA and RNA-- as well as potassium, essential to heart function and smooth muscle contraction. A recent study which published in the Journal of Agricultural and Food Chemistry is done on 57 patients who had heart surgery. An group of participants add a grapefruit into diet and other group don’t add any kind of any grapefruit. The results showed that people who eat grapefruit will reduce cholesterol and reduce their fat content. 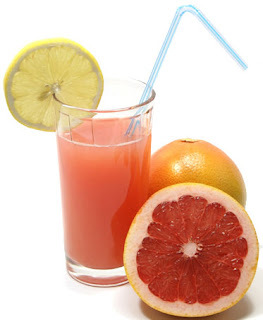 Grapefruit juice decreased LDL cholesterol significantly in a month. Grapefruit has a compound called d-limonene. It prevents the formation and dissolve kidney stones. A study of the British Journal of Nutrition found that women who drink half a liter to a quart of grapefruit juice per day will reduce the pH levels in their urine, thereby reducing the risk of developing kidney stones. However, if you have been treated for kidney problems, grapefruit juice can interfere with the effectiveness of drugs that you’re using. Grapefruit are rich in antioxidants such as vitamin C which contribute to reduce the risk of stress related to cancers. Also a recent study shows that a compound in grapefruit called naringenin which is effective against prostate cancer, because it helps to repair damaged DNA in cells. According to another study, grapefruit contains a substance called limonoids which help prevent cancer by promoting the expulsion of toxins from the body. Limonoids also help against cancer of the mouth, skin, lung, stomach. It is also effective against breast cancer. Grapefruit had no fat and contains a enzyme which burns more fat. The studies show that they contribute to change in insulin levels, thereby affecting the metabolic rate highly. With high levels of vitamin A with strong antioxidant properties of vitamin C, grapefruit helps to maintain moisture in the skin, protect skin from dryness, psoriasis, acne and wrinkles. 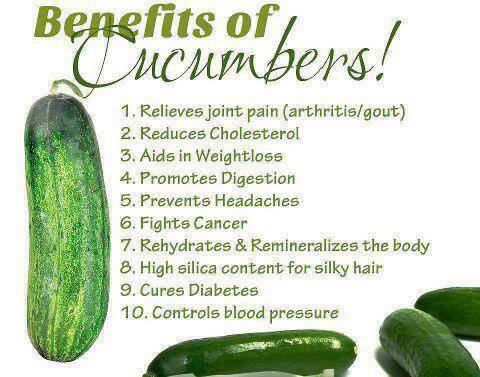 Cucumber The top nutrient in cucumbers is vitamin K, which is key for bone health. One cup of cucumber with the peel still on supplies over 20% of the recommended daily target for vitamin K. This nutrient is required for bone formation, and several studies have linked low K levels to osteoporosis and increased fracture risk. It is one of the very low calories vegetable; provides just 15 calories per 100 g. It contains no saturated fats or cholesterol. 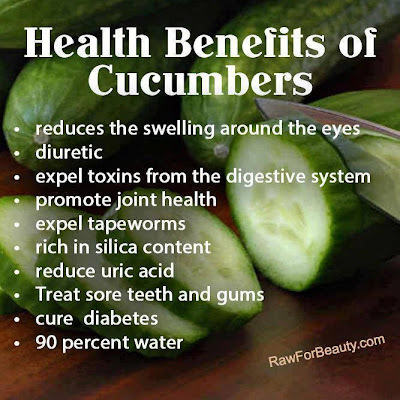 Cucumber peel is a good source of dietary fiber that helps reduce constipation, and offers some protection against colon cancers by eliminating toxic compounds from the gut. It is a very good source of potassium, an important intracellular electrolyte. Potassium is a heart friendly electrolyte; helps reduce blood pressure and heart rates by countering effects of sodium. It contains unique anti-oxidants in good ratios such as ß-carotene and α-carotene, vitamin-C, vitamin-A, zea-xanthin and lutein. These compounds help act as protective scavengers against oxygen-derived free radicals and reactive oxygen species (ROS) that play a role in aging and various disease processes. 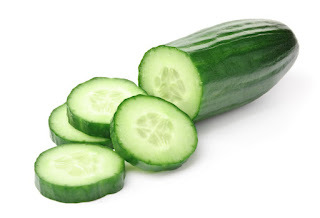 Cucumbers have mild diuretic property probably due to their high water and potassium content, which helps in checking weight gain and high blood pressure. They are surprisingly have high amount of vitamin K, provides about 17 µg of this vitamin per 100 g. Vitamin-K has been found to have potential role in bone strength by promoting osteotrophic (bone mass building) activity. It also has established role in the treatment of Alzheimer's disease patients by limiting neuronal damage in their brain.